A sign inside the Basilica San Marco invites you up a steep stone stair to the gallery, containing St Mark's Museum, or the Museo Marciano and Loggia dei Cavalli. At the top of the stairs are a couple of rooms housing evocative fragments of the original mosaics and odds and ends, including a 16th-century double bass, which once accompanied St Mark’s famous choir. The Loggia offers a mesmerizing pigeon-eye view of the piazza, and lets you take in some of the rich sculptural and decorative details of the Basilica itself. The four replica horses on the façade, paid for with much fanfare by Olivetti, don’t bear close examination after you’ve seen the originals, restored and regilded in 1979, only to be imprisoned inside – one of the saddest sights in Venice, for they were made to glint in the sun and shimmer in the light of the moon. 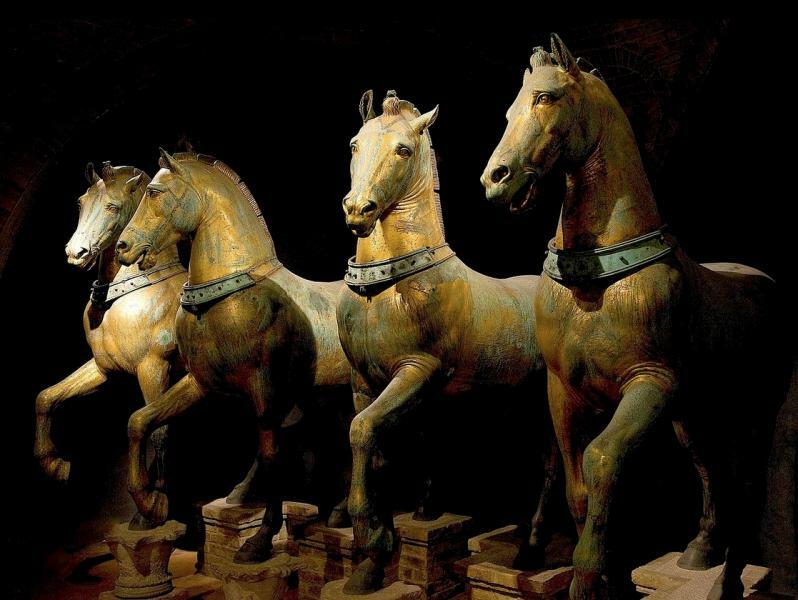 This, after all, is the only bronze quadriga (four horses that once pulled a triumphal chariot) to survive from antiquity, though no one is sure whether the Greeks or Romans cast them, or when – suggested dates range from the 4th century BC to the 2nd AD. Some scholars attribute them to the great Lysippos, Alexander the Great's personal sculptor, though this is disputed. Roman Emperor Constantine the Great, himself no greenhorn in the plunder department, picked them up perhaps on the Greek island of Chios or in Rome, to embellish his new capital. Subsequent Byzantine emperors put them in the place of honour overlooking Constantinople’s Hippodrome until the Venetians snatched them in 1204. Originally the horses stood by the Arsenale, until someone had the extraordinary idea of putting them on the terrace of the Basilica, where they soon became one of Venice’s best known symbols. Napoleon took them to Paris and installed them on his triumphal arch in the Place du Carrousel, by the Louvre, where they stayed for 18 years. Directly after Napoleon's defeat in 1815, the Austrian Emperor saw that they were returned to Venice. During the First and Second World Wars they were packed off to Rome and Padua for safekeeping. The other treasures of the Museo Marciano aren’t always on display: Paolo Veneziano’s painted Cover for the Pala d’Oro (1345) and a series of early 15th-century tapestries on the Life of Christ, woven after designs by Nicolò di Pietro. From the Gallery inside the Basilica there’s a wonderful view into the shadowy golden interior, and your best chance to get a close view of its mosaics.